Grace-Filled-Moments : March Scripture Prayer Calendar - Now Available for Husbands Too! 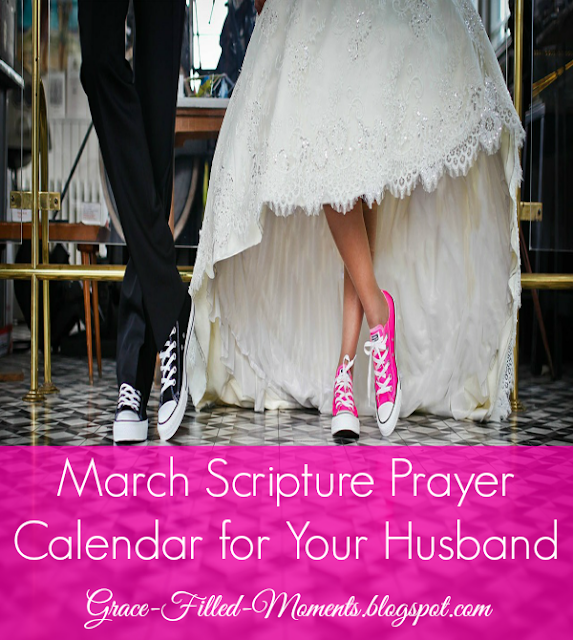 March Scripture Prayer Calendar - Now Available for Husbands Too! I was thrilled to get a private message from a reader asking me if there would be anything out there like my Scripture Prayer Calendar for Your Husband that her husband could use to pray over her! Bless her heart! She knows the power of prayer and desires prayer for herself from her husband! Well, I told her I would be very happy to make a Scripture Prayer Calendar for husbands to use to pray over their wives. The Scriptures are identical on both calendars so you both will be praying the Word in agreement over each other - that is just beautiful! It's what my husband and I have been doing since I've been creating these prayer calendars. Now you and your husband can do the same! Are you using these Scripture Prayer Calendars? I would love to hear from you - please leave me a comment below! Here are the FREE March Scripture Prayer Calendars for you and your husband! May God knit your hearts together in prayer for your marriage using these Scripture Prayer Calendars! Simply click on the images below to download your March Scripture Prayer Calendars. If your husband is looking for a Scripture Prayer Calendar for Your Wife, I'm so happy to present to you this FREE March Scripture Prayer Calendar for Your Wife! I use the prayer calendar. I hope that you will be doing a calendar for April. My husband and I love your calendars! I hope you will continue to make them for the full year. Thank you for taking the time to offer such a valuable resource!